I teach at a 1:1 Mac school. This year marked our third year with laptops at the high school and I knew I wanted to do something differently with student journals. Last year I had students typing them in a Pages document (Pages is an iWork word processing application). And though journals are personal reflection, I wanted to take it a step further and venture into blogging. I had students write journals online in the past. But that involved reserving the computer lab and hoping the internet worked and all the computers were working properly. They wrote posts on our old school website and every entry had to be approved. It was tedious and students rarely had the opportunity to read their classmates' entries. So this year we started a group blog on Blogger. I urged students to remember this was for public viewing and they should write in complete sentences, use complete words rather than texting lingo/abbreviations, and always spell check. Well, it didn't quite start the way I would have liked. This post, for example. And this one. And this. 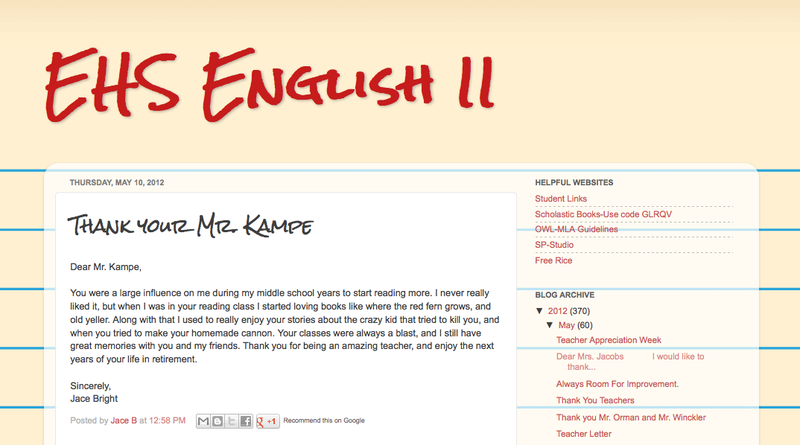 No matter how much I urged my students to write more, write better, they didn't really seem to care. Though I do think their writing online is improving, I have to remind them this isn't a Facebook status update. I think it's important to allow them to practice responsible online writing. In addition, many will be taking early college courses that require blogging. 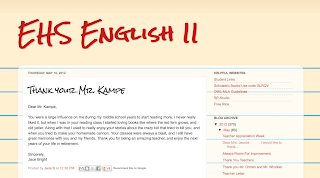 I was shocked that even though my students had their laptops for three years, only a couple of them had ever blogged before. Now, many of them have started their own in addition to our class blog. Learning this skill is another way to prepare them for a digital future. If you are on the fence about blogging, I suggest giving it a try. On Blogger you can have up to 100 authors for one blog. It's pretty easy to set up and add authors (you'll need their email address to invite them). If it doesn't work out, you can always delete it. But you'll never know unless you try. I have been wondering how students might do with blogging. Saying hello from the giveaway at A Teacher's Treasure. I love this idea. We do not have computers for every class, let alone every student but I was still thinking of doing collaborative blogging at times in middle school science next year. I popped over from A Teacher's Treasure giveaway but I will be back for sure. Hi! I'm a new follower! Stopping by from A Teacher's Treasure! Thank you all for stopping by & following! :) And good luck in the giveaway!